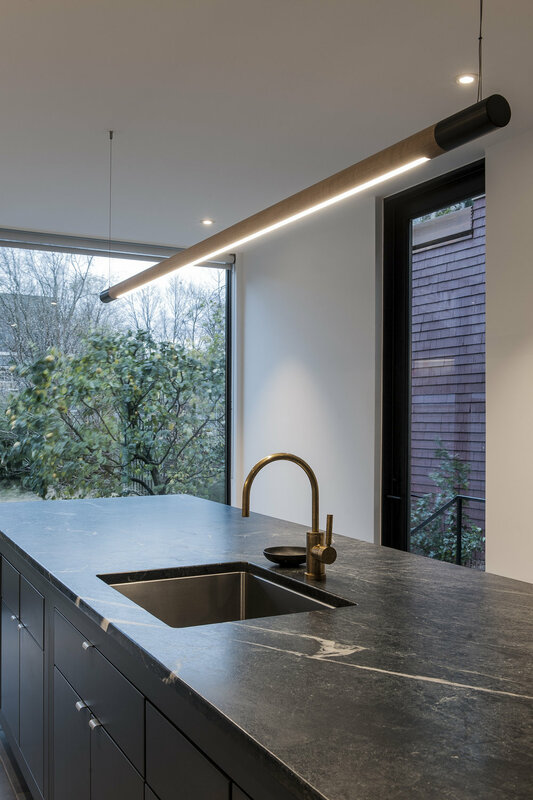 GARDEN HOUSE is a residential heritage renovation that involved opening up the ground floor in order to bring more light into the depth of the living space and link a new kitchen to the garden. The design utilizes a floor to ceiling, wall to wall window blurring the line between interior and exterior. A long wall of white cabinets with marble counter and inset wall surfaces balances the large blue-grey island with soapstone top. Brass fixtures, and a Hollis+Morris pendant light articulate the space. All cabinet interiors are custom waxed oak maintaining a natural finish. Several interior walls were removed in order to complete the renovation, yet structural beams were all hidden in order to keep the ceiling space running fluid from living / dining to kitchen. The ceramic tile floor incorporates in-floor heat. Structural Engineer: Andrea Doncaster Engineering Ltd.